With the stunning golden glow of the majestic sandstone cliffs and the shimmering radiance of Golden Cap, West Bay, Dorset is the Golden Gateway to the Jurassic Coast. West Bay nestles south of Bridport, between Eype with Seatown to the west and Freshwater with Burton Bradstock to the east. Situated at the western end of Chesil Beach / Chesil Bank, the area forms part of the Dorset Jurassic Coast World Heritage Site within Lyme Bay. West Bay, Dorset is a wonderful seaside location for family holidays, coast and countryside walks, fossil hunting, fishing / angling trips, scuba diving, paragliding, golfing, river boating and so much more. The Dorset historic market town of Bridport lies one and a half miles inland from the West Bay coast. Bridport Harbour and Marina in West Bay offer children the delight of crab fishing. There are play areas, swimming pool with fun slides and amusement arcades. A health and leisure complex is in Bridport. Rowing boat hire is available and a fun fair visits West Bay during the prime holiday weeks. But above all, West Bay offers the family outstanding beaches to roam and the space to play. Bridport is a vibrant market town set inland from the West Bay coast, amongst the Dorset hills. With farmers and street markets, Bridport also offers arts and craft shops. Bridport also boasts the familiar supermarkets and high street stores. Glorious Dorset countryside surrounds Bridport. From the end of the Jurassic Pier at West Bay, you can view the coast from South Devon to Portland in Dorset. Launch your boat at the West Bay Marina (Bridport Harbour). West Bay is a major gateway to the Jurassic Coast, which covers 95 miles of coast from Orcombe Rocks at Exmouth, Devon to Studland Bay in Dorset. Sometimes known as the Dinosaur Coast, tourists throughout the World visit Dorset for fossil hunting in stunning coastal scenery. 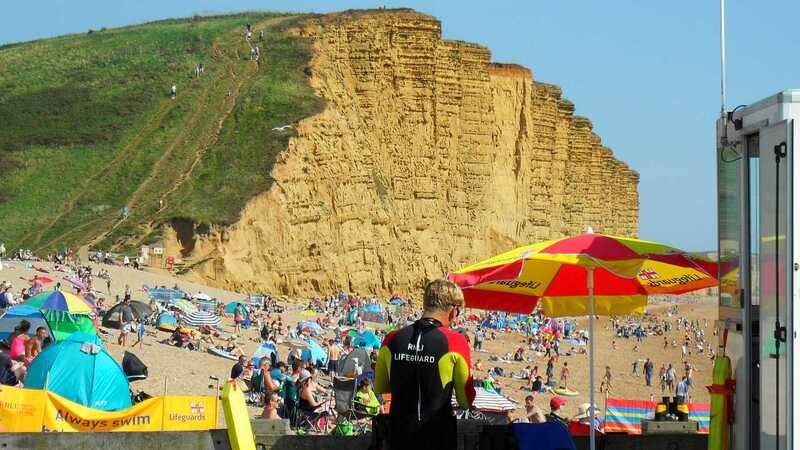 The famous sandstone East Cliff at West Bay, formed from Lower Jurassic Bridport Sands exposes 180 million years of history. Holiday vacations are catered for with various Bed and Breakfast establishments, Guest Houses, Hotels and Inns, Self Catering Cottages and Apartments, Holiday and Camping Parks in West Bay, Bridport and the West Dorset area. Dorset is renowned for its food, with West Bay and Bridport having excellent places to eat including quality Restaurants, Diners, Cafés, Tea Rooms and Pubs (seafood often being a speciality). Flanked either side by cliffs, the seaside and harbour areas of West Bay, Dorset are predominantly level. Although West Bay has all you need for your beach and sea vacation, Bridport Town is a short bus ride away or a very pleasant 20-minute walk.